Cornish local commercial radio station Pirate FM is making final preparations for the launch of a new spin-off service on local DAB digital radio and online. 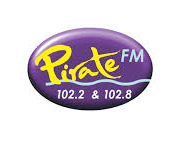 Pirate 2 will launch on 4th August, and is understood to be taking over the DAB slot currently used to simulcast the main FM station across Cornwall. Pirate MD Mark Peters said: "This is really us taking the local heritage of Pirate FM to a brand new and really exciting level, where we can deliver huge amounts of new content to our loyal listenership and new listeners as well. "The great thing about this new platform is that we've got award winning presenters on our radio station. We're incredibly proud of that so you're still going to hear all of your favourite presenters and all of your favourite shows: Neil and Tina, Scott, JD - they're all going to be there on our brand new baby." Isha Pit is part of the team putting together the new radio station. She said: "We will have The Business Hub, which will air every Monday, which will focus on helping everyone in business succeed - in particular the local community. "We also have The Farming Show, which of course will be very important for the local area. We have The Health and Wellbeing Show, The Homes and Gardens Show and The Education and Training Show. Although the station will be broadcast live on DAB all the shows will be made available on-demand.